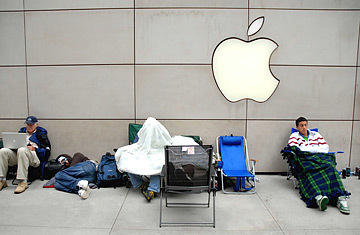 People wait in front of the Apple store in Chicago Illinois for the chance to buy the Apple iPhone. Expectations come at a price. Dubbed the "Jesus Phone," the iPhone has raised the bar of consumer anticipation so high that regardless of how well it actually works, some will be disappointed. Steve Jobs hopes to sell 10 million of his newest toy by the end of next year, but there are several factors that may spoil the iPhone party. At $500 a pop and $60 a month for the cheapest flavor of service, plus various taxes and fees, the iPhone will cost at least $2,000 over the course of a two-year contract. Those who don't want a data plan of the sort the iPhone comes automatically bundled with, may stick with other companies' free phones and cheaper plans. The iPhone's data plan actually adds less to the total price than similar offerings from Verizon, for instance, but because there is no way to opt out of the data plan, those who don't want to use the iPhone's Web capability may find the fee superfluous. Steve Jobs and Co. proudly boosted the device's promised battery life recently, claiming it will offer 24 hours of audio playback or 8 hours of talk time. Early reviews score the iphone's battery high compared to many competing phones'. But when consumers use the device as an iPod for hours at a time, watching videos from YouTube and listening to their favorite songs, they might be surprised to find the gadget drooping when they're expecting an important call. There's a precedent for problems with Apple batteries, as many who owned an early iPod model know all too well. AT&T has been bulking up, spending billions in recent years to speed up its EDGE data network, its call capabilities and its 3G, high-speed data system. But the iPhone won't work on AT&T's 3G network, and early reviews question whether AT&T's slower edge network will hurt the speed of the iphone's web browsing. AT&T spokesman Mark Siegel says connection speeds can vary widely depending on where and how the phone is used. Some info, like maps, stock quotes and weather updates can load in seconds. But if sites regularly crawl for a full minute before loading, memories of the old days of screeching dial-up may burst the iPhone bubble. With a decade of experience in the market, Motorola, Nokia, Samsung, Sanyo, Palm and Blackberry, have all been developing iPhone alternatives. Apple left its rivals competitive room by omitting some bells and whistles on the iPhone. There is no instant messaging program on the phone, just text messaging; the camera lacks zoom, flash and video�some of these features may be added later through software updates; and you won't be able to use it on any U.S. network other than AT&T's for at least two years. That might be time enough for a more broadly accessible phone, available across multiple carriers, to steal some of the iPhone's thunder. After spending years learning to master Blackberry thumb typing and Palm's Graffiti data entry, some business users may be reluctant to switch over to finger typing on a glass screen. Jobs says it's actually easier to type fast on an iPhone than on a Blackberry, but the test will be whether millions of fingers  fat, flat and stumpy can navigate the screen as smoothly as veteran techies. If the learning curve proves too steep for early adopters, the early buzz might shift slightly, tempering the enthusiasm of those waiting out the first model's release.